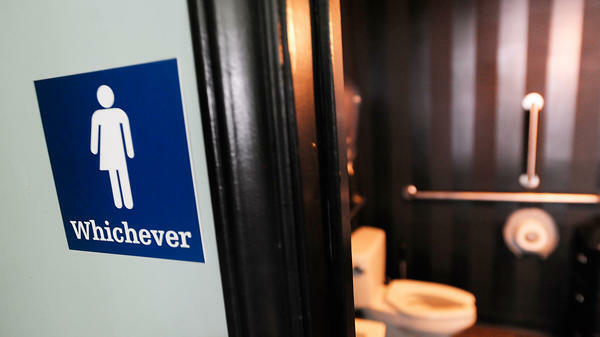 A gender-neutral sign is posted outside a Durham, N.C., bathroom in May 2016. "Transgender and gender non-conforming young people are already subjected to bullying and harassment," the letter reads. "Can you imagine the message these bills send to children — the message of 'that child is unwelcome, that child is dangerous?' "
In an interview with Billboard, producer and musician Jack Antonoff, who helped draft the letter, said that he wants the state "to know that me and all of my friends — all of these wonderful artists and actors and writers and designers — are watching Texas and are not OK with this happening." Texas Lt. Gov. Dan Patrick has made the legislation a priority. In a note on the initiatives, he wrote that: "Legislation to protect women's privacy and business is essential to assure that sexual predators ... will not be able to freely enter women's restrooms, locker rooms or showers. ... "
Texas House Speaker Joe Straus voiced concern over the bill's economic impact on the state in an interview with Texas Monthly in mid-January, saying the state "should be very careful about doing something that would make Texas less competitive for investments, jobs, and the highly skilled workforce needed to compete." Similar legislation in North Carolina has cost that state $600 million in its first six months, according to an estimate by Forbes. A study released in early December 2016 by the Texas Business Association claimed the legislation, as well proposed limitations on nondiscrimination by businesses based on religious objections, if passed, could subtract between $964 million and $8.5 billion from the state's gross domestic product and up to 185,000 jobs, as well as "alienate large, globally recognized businesses" including Apple, Google and the NFL.